ICanToo - 100% Cotton Double Gauze 3/4 Sleeve V Neck Top - 7424-DG. 100% Cotton that is Double Layers of Gauze fabric, so you keep cool without the see through issues of single gauze. Lightly textured gauze gives a interest and spring to this cotton top. Classic V Neck with the side slits at the hem brings comfort and ease in movement. This Double Gauze is ultra soft, and will be a favorite for your summer. Truly stylish comfort. Women's sizes in S, M, L, XL, and 2XL. Be sure to see details in Size Chart. Made in USA. 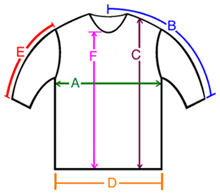 A: Chest / Bust circumference 40" 42" 45" 47" 51"
B: Sleeve length from center of neck to end of sleeve 25" 25" 25" 26" 26"
C: Body length from shoulder to bottom of hem point 23" 23.5" 23.5" 25" 25"
D: Hem circumference 45" 46" 50" 52" 53"
E: Sleeve length from shoulder to end of sleeve 16" 16" 16" 16" 17"
F: From the bottom of the Neck to hem point 17" 17" 17.5" 18" 18.5"